St. Sixtus Abbey, Flanders, 1981. Roseman drew at the Divine Office, the canonical hours when the monks assemble in choir to pray and to chant the Psalms in the early morning, throughout the day, and at Vigils in the night. The St. Sixtus abbey church, an intimate, rectangular structure of ochre-colored bricks illuminated by rows of windows near the ceiling, with panes of gray- and beige-colored glass, provided the tonal leitmotif in Roseman's use of chalks on ochre paper. The Graphische Sammlung Albertina, Vienna's world-renowned collection of Master Drawings, was the first museum to acquire Roseman's work on the monastic life. The acquisition included A Visiting Benedictine in a Trappist Choir, (fig. 2), drawn at St. Sixtus in early October and purchased the following month by the Albertina. Roseman's work at St. Sixtus Abbey includes the impressive drawing A Trappist Monk at Dinner, conserved in the Musée des Beaux-Arts, Bordeaux, (fig. 3, below). "The monastic meal is an ancient ritual observed with great formality,'' explains Roseman in writing about his work on the monastic life. "The meal is taken in silence while a reader, assigned for the week, reads aloud from an edifying book. The Rule of St. Benedict prescribes regulations regarding meals. There are chapters on the hours meals should be taken, the weekly servers in the kitchen, the weekly reader, the measure of food, and the measure of drink. . . . Trappists maintain an abstemious diet which, among other restrictions, prohibits the consumption of meat and meat by-products. . . ."
On subsequent returns to St. Sixtus Abbey over the years, the artist created equally fine drawings of the monks at prayer, work, and study, as well as portrait drawings of members of the community, exemplified by Brother Jos, 1981, in the Musée des Beaux-Arts, Rouen, and reproduced on the website page "Exhibition at the Albertina." Roseman also painted a beautiful oil on canvas portrait Abbot Remi, which the monastery commissioned in 1981 on the occasion of the 150th anniversary of the founding of St. Sixtus. The Boston Globe published in 1979 on its page "US and World" a news article entitled "Monks' life through art," the first reportage of Roseman's work on the monastic life, which was to again receive praise in newspapers and journals worldwide. The Boston Globe published in 1981 a cover story on the artist in its Sunday magazine. 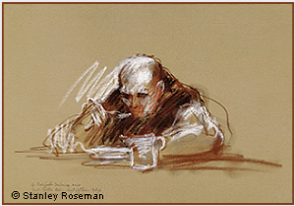 A Trappist Monk at Dinner is one of several works by Roseman featured in The Boston Globe Magazine. Stanley Roseman - Zeichnungen aus Klöstern, 1983. "I don't know how I can thank you sufficiently. It is a very beautiful and artistic present. I showed it to Brother Petrus. We will look for a good place. Abbot Gerard Mathijsen, greatly encouraging to the artist in his work on the monastic life, welcomed back Roseman and Davis on returns over the years to St. Adelbert Abbey, where they always received gracious hospitality from the Abbot and the Community. 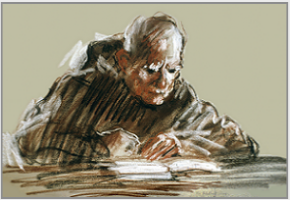 An excellent portrait drawing of Abbot Gerard is featured on the website page "Monastic Journey Continued," Page 2 - "Returning to the Netherlands." The librarian at St. Adelbert Abbey, Brother Thijs, a Biblical scholar, made the library accessible to Roseman and kindly assisted the artist with his research on monasticism. The journey to monasteries brought Roseman and Davis to the Netherlands, where they were warmly received by the Benedictine monks of St. Paulus Abbey, near Breda, and St. Adelbert Abbey, in north Holland. "During the Merovingian and Carolingian periods, with the great expansion of monastic life throughout Europe, many monasteries developed into self-sufficient urban centers, or monastery towns. For example, the ninth-century architectural plan for the Abbey of St. Gall, which gave rise to the city by that name in northeast Switzerland, records the extensive monastic complex of abbey church and numerous conventual buildings; workshops, farmyards, gardens, and orchards; infirmary and doctor's house; school, guesthouse, kitchen, bakery, and brewery; and a hospice for pilgrims and the poor. . . .
"The Benedictine Archabbey of St. Ottilien, about 40 kilometers west of Munich, is a modern-day monastery town,'' Roseman further relates. "Founded in 1884, St. Ottilien developed from a modest, mission settlement to the present, sprawling complex comprising the abbey church and buildings for the monastic community, some twenty workshops, farms for livestock and poultry, and many acres of land under cultivation. "The monastery runs a boarding school, junior college, guest house, and retreat center. The printing company continues a centuries-old monastic tradition of book production, and a bookstore and boutique offer publications and products from St. Ottilien and other monasteries. A hotel and restaurant accommodate guests and pilgrims. An ethnological museum of African and Asian culture relates to the Congregation of St. Otillien's missionary activities in Africa, Asia, and South America. 8. 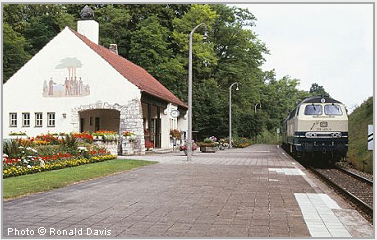 The St. Ottilien Train Station. between Augsburg and Garmisch, 1984. The Archabbot invited Roseman and Davis to St. Ottilien in 1984 on the occasion of the monastery's 100th anniversary of its founding, and again the artist created a series of impressive drawings. The Prior of the Trappist Abbey of Westmalle, Father Tillo writes to Roseman and Davis: "We feel delighted to have you both at our guesthouse,'' and closes with the words, "Let us hope you will feel at home here.'' The Prior's letter foretold of the generous hospitality the two friends were to receive at Westmalle that October 1978. The Trappist monastery, located in the province of Antwerp in northern Belgium, dates its origins to 1794. With the gift of a farm at Westmalle, the nascent community continued the Trappist tradition of working the land. In 1836 the Abbey began operating a small brewery that grew into a major producer of excellent quality beer. "After breakfast, when I had returned to my room to prepare my paper and chalks, there was a knock on my door. Father Tillo, the Prior, had come to ask if I would like to begin my work that morning. He said that Abbot Bartholomeus had placed a notice on the bulletin board in the cloister to tell the Community that I would be drawing in the monastery. I was very appreciative of the Abbot's thoughtfulness, and with his and the Prior's enthusiasm, I was all the more excited to begin my work. Roseman further relates in his journal that the following day he was greeted by Brother Petrus, who was taking his exercise walking in the cloister. Having paper and his box of chalks in hand, the artist thus had the opportunity to create the wonderful drawing Brother Petrus walking in the Cloister, (fig. 4), a work much appreciated and reproduced in The Boston Globe Sunday Magazine cover story on Roseman and in the Belgian art magazine Kunstecho's, which also published an enthusiastic reportage on the artist's work on the monastic life. Benedictines have a long association with books. Monasteries were major producers of books in the West from the sixth through the twelfth century, and scholarship and literary work continue to be an important part of Benedictine monasticism. The Rule of St. Benedict assigns great importance to lectio divina, sacred reading, and allocates a significant portion of time in the monastic schedule for reading and study. 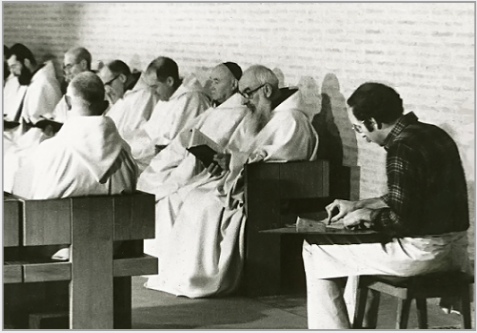 Having a love of books himself, Roseman sought the monastery library for his own reading and study as well as a place in which to draw, exemplified by the beautiful drawing Father Adelbert absorbed in Reading, St. Adelbert Abbey, 1978, (fig. 5). Father Adelbert is named after the eighth-century saint who was venerated in the region of Friesland and whose relics are preserved in the abbey church. St. Adelbert Abbey traces its history to the founding of a monastery in the tenth century in what is today the village of Egmond-Binnen. By the end of the eleventh century, the monastery's flourishing scriptorium was producing notable manuscripts that included a history of Holland. Abbot Odilo thoughtfully extended his invitation to Roseman and Davis to return to St. Bonifaz Abbey after their journey to monasteries in Austria, Hungary, and Poland. Returning in late November and resuming his work at St. Bonifaz, Roseman also drew a fine portrait of Abbot Odilo as a gift to the monastery in appreciation to the Abbot for his gracious hospitality and sincere encouragement of the artist's work. The monk seems an anonymous figure seated in choir, his hood covering his head lowered in prayer and his hands tucked into his sleeves. A Benedictine Monk in Choir is an appropriate pictorial image to represent the generations of monks who have given their collective identity to the name of the city, München. The Bibliothèque Royale de Belgique, which houses an important collection of prints and drawings, conserves this fine work with its lively synthesis of line and tone in black and bistre chalks and accents of white. 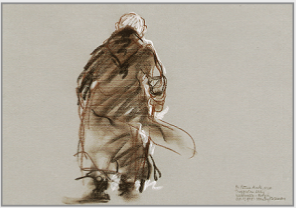 The poignant drawing of Brother Petrus depicts the elderly monk as he walks with cane in hand down the cloister at Westmalle. The artist effectively uses white chalk to describe forms, as with the bowl and pitcher in the foreground and the monk's right hand holding a spoon; to render highlights on the elderly monk's forehead, cranium, and sleeves of his tunic; and to indicate spacial dimension. Roseman has created a striking pictorial image of a Trappist monk at dinner. The diagonal composition and the fluid strokes of black and bistre chalks that depict the Benedictine habit bring the viewer's attention to the monk's face finely rendered in bistre and black with touches of white on his closely cropped beard. The monk's hands are held together in a reverential gesture as he kneels in prayer. The present work Father Damian in Choir, 1984, (fig. 9), entered the Teyler Museum, in the Netherlands. The Museum houses a renowned collection of Master Drawings from the Italian Renaissance, including sheets by Michelangelo and Raphael, and from the seventeenth-century Dutch School, notably prints and drawings by Rembrandt. Roseman drew in the refectory of St. Sixtus during mealtimes. Brother Pacific, the seated figure on the left in choir in the Albertina drawing above, is seen here in the refectory. The pyramidal composition places the figure in the center of the page, with strong contrasts of black and white chalk in the depiction of the monk's black scapular and white tunic. The ochre paper imparts a warm tonality to the composition and suggests the ambience of the refectory, built of ochre-colored bricks, with floor tiles of ochre and sepia. A Visiting Benedictine in a Trappist Choir is a fascinating depiction of three distinct personalities whose monastic profession brought them together for the Divine Office in choir. With vigorous strokes of black, white, and bistre chalks, Roseman effectively abstracts the voluminous forms of the monks' cowls in contrasting light to dark to light. The rectangular format and the ochre paper suggests the architecture and ambience of the abbey church. The monks' faces are finely rendered with the blending of the chalks. In this captivating drawing, the Trappist monk on the left, wearing a voluminous white cowl, leans forward; the visiting Benedictine clothed in a black cowl sits upright; and the bearded Trappist has settled into his place in choir. The ruddy complexions indicated by accents of red chalk on the faces of the two Trappist monks tell of their work on the farm, a traditional Trappist occupation. 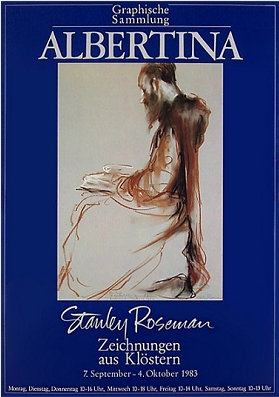 Stanley Roseman's work on the monastic life - a life centered on contemplation and prayer - brought the artist and his colleague Ronald Davis in spring and summer of 1978 to Benedictine and Trappist monasteries in England and Ireland. Davis participated in the research and planning of the itinerary and wrote letters to monasteries to introduce the artist and explain their request for a visit. In early September, they returned to their first monastery, St. Augustine's Abbey on the coast of Kent, where the artist resumed his work. With letters of invitation from monasteries on the Continent, the two friends departed England at the end of September, took a Hovercraft across the English Channel to Calais, and drove north to Flanders. Having retired from the important administrative post of novice master in charge of the education and preparation of those aspiring to the monastic life, Father Adelbert had considerably more time for spiritual reading. In a clear, northern light entering the library, Roseman has rendered with strong chiaroscuro modeling the Benedictine monk seated at the reading table. The monk's black Benedictine habit establishes the pyramidal composition, and the gray paper imparts a cool atmospheric tonality to the drawing. The viewer's attention is engaged by the open book; the monk's hands, one of which rests on a line of text; and the face of the monk, whose eyes under bushy white eyebrows are intently fixed on a page. The majestic Baroque Abbey of Melk, a centuries-old Benedictine monastery of great historical importance in the spiritual and cultural life of Austria, was the next destination for Roseman and Davis on their journey to monasteries across the Continent. 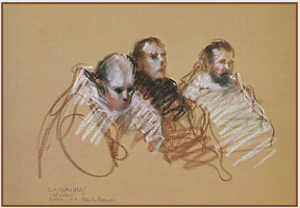 Father Damian in Choir is exemplary of Roseman's skillful handling of the chalk medium, with a harmonious interaction of line and tone in rendering form and expressing the identity of the individual. In the late nineteenth century, Westmalle was a leader in establishing the branch of Cistercian monasticism called the Order of Cistercians of the Strict Observance, more familiarly known as the Trappist Order, from the ascetic reforms instituted at the Abbey of Trappe, in Normandy, two centuries before. 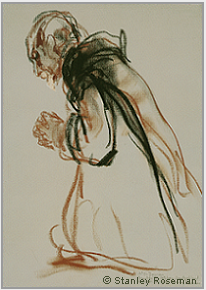 In the engaging drawing A Benedictine Monk in Choir, St. Bonifaz Abbey, 1978, (fig. 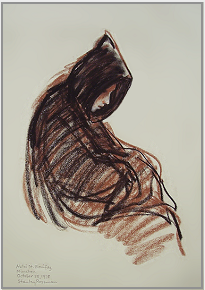 7), Roseman depicts a seated monk enveloped in his voluminous black cowl. Vigorous black and bistre parallel hatching is complemented by curvilinear strokes of black chalk describing the cascade of folds of the monk's wide sleeves. Bistre chalk gives warm shading to the cowl. 1. Louis J. Lekai, The Cistercians (Ohio: Kent State University Press, 1977), pp. 448, 449. 2. Pierre Riché, The Age of Charlemagne (Liverpool: Liverpool University Press, 1978), p. 35. (Princeton: Princeton University Press, 1980), p. 225. 4. Riché, The Age of Charlemagne, p. 39.